We never miss an opportunity to add a fun theme to the events we put on, and this Info Expo was no exception. 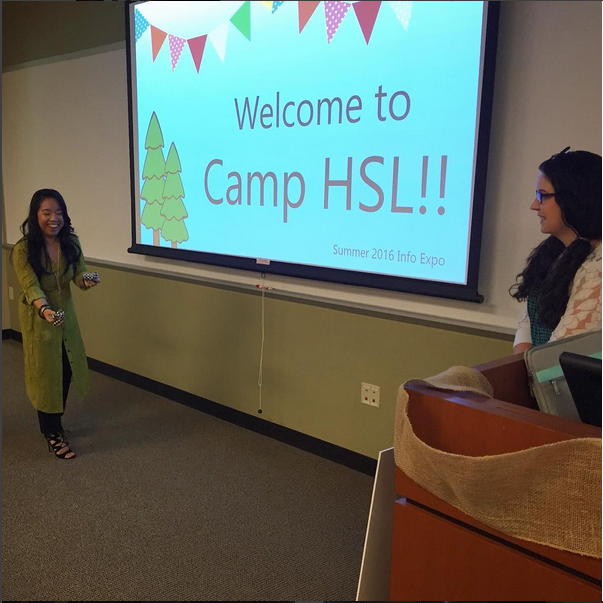 We welcomed our faculty and staff attendees to “Camp HSL” with summer camp themed raffle prizes, food, and decor. Our four “Camp Counselors” provided four information-packed presentations, which you can find links to below. Our of our “Campers” playing a bean bag toss game to win more raffle tickets! The first block of the Expo provided a review of two devices Apple released last year, the iPad Pro and the Apple Watch. As we like to keep up with the latest technology around here, we thought it would be appropriate to share our thoughts about the devices now that we’ve had a year to explore them. Raney Collins and Natasha Williams, one of our Sr. Library Technical Assistants and our User Services Librarian respectively, presented on their experiences with the iPad Pro, and what they’ve figured out to be the best and worst aspects of the device. Overall, they’ve concluded that while it’s unlikely that it will ever truly replace a laptop when it comes to productivity, the iPad Pro (and particularly its Apple Pencil accessory) is an excellent tool for artists, and a unique addition to the iPad family. As for the Apple Watch, Shalu Gillum, our Head of Public Services, feels that even though the Watch doesn’t exactly live up to the expectations and hype in her experiences, she has found ways to make it useful in her own life and recommends the purchase if you have an iPhone. As a fitness tracker, the Apple Watch hasn’t been the most useful to her (an avid runner), but she has found the most value in the device when she needs to be hands-free from her phone. Click here for a link to our iPad Pro assessment, and here to see the review of the Apple Watch. Amelia Strickland, another of our Sr. Library Technical Assistants, followed these presentations with a brief but informative talk on the Zika virus. Basically, it’s highly unlikely you’re going to catch Zika, so don’t panic! Amelia detailed the ways you can protect yourself from catching the virus, and what do in the event that you do contract it. Many links to excellent health resources can be found inside her presentation, so be sure to check out her slides. Shalu closed the session with another installment of our very popular Apps & Gadgets segment. She’s got another fun list of smartphone apps and funky gadgets that may be useful for what’s left of the summer, so give it a look! Thank you to everyone who was able to attend – we were pretty content heavy this time around and we appreciate you sticking it out to the end! If you took any photos during the event and would like to share them with us, tag us on Instagram @ucfcomhsl with the hashtag “HSLInfoExpo”.